Our Cream Maxi Dress with Mesh Detail is gorgeous! It features a jewel and mesh detailed top, open back and elegant Cream color! 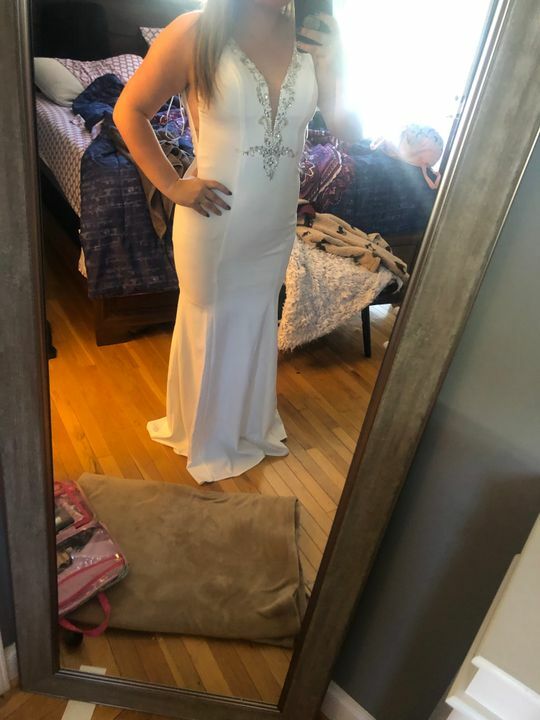 This dress is exactly what I was looking for! I’m 5’7 180 and the large was perfect! Tight enough to hold in my insecurites but super stretchy for comfort! Love love love it!!! Purchased this as my wedding dress. It fits amazing and the second i tried it on i knew it was what I’d wear on my day! Thank you for helping me make my wedding day perfect! Beautiful Dress! Very fitted around waistline. Material is very Pretty as well. Make sure to review size before placing order. A bit too tight for me around the middle so unfortunately had to return. Usually wear a medium.